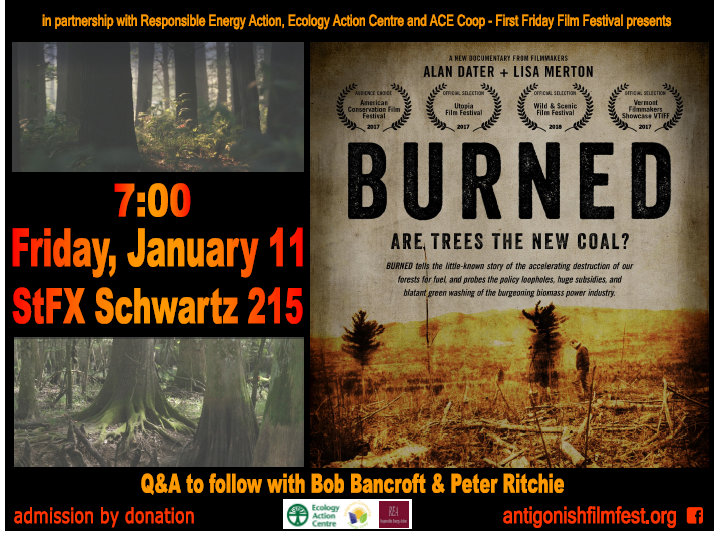 About 100 people attended a showing of Burned, a film that exposes the little known story of the accelerating destruction of our forests for fuel. It probes the policy loopholes, huge subsidies and blatant green-washing of the burgeoning biomass power industry. The film was followed by a discussion led by wildlife biologist Bob Bancroft and energy analyst Peter Ritchie. 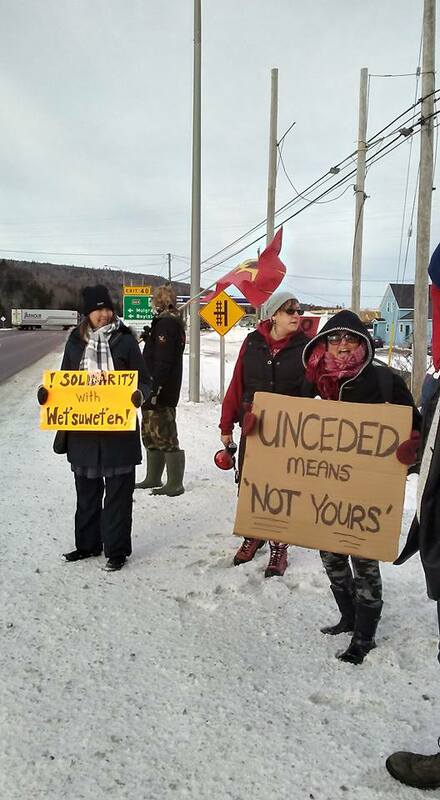 Grassroots Mi’kmaq activists stood in solidarity with Wet’suwet’en people on the West Coast who are resisting plans to extend the TransCanada Coastal GasLink pipeline through their sovereign territory. The RCMP had moved into the Unist’ot’en camp following a BC court injunction and arrested 14 people including 3 Mi’kmaq. 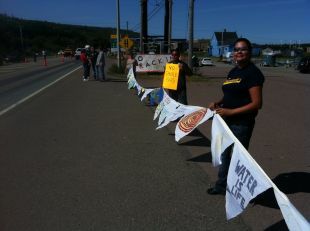 REA members joined Mi’kmaq at the Canso Causeway to show solidarity and hand out pamphlets to drivers. 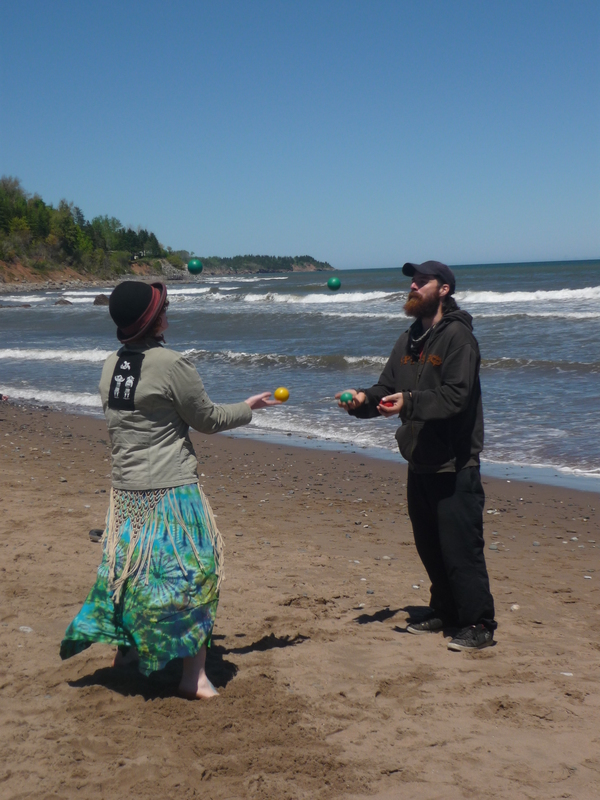 50+ solidarity events happened across Canada and internationally. 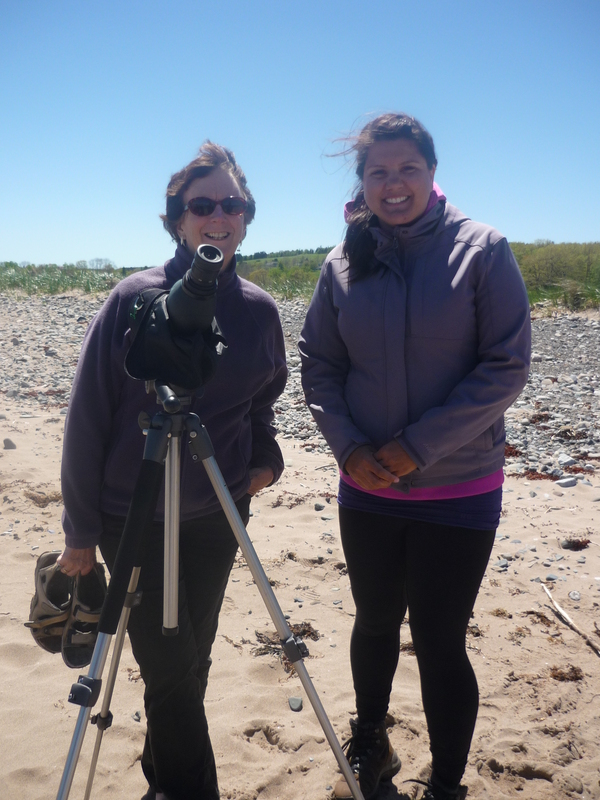 Responsible Energy Action sponsored Eliza Starchild Knockwood’s film The Water Protectors Journey: Along the Sipekne’katik River, as part of the Antigonish International Film Festival opening gala. 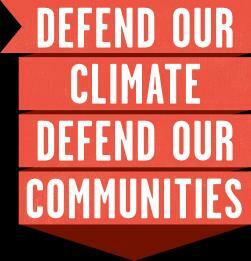 On May 29th, Canada had announced that “we” would purchase the Kinder Morgan Pipeline for a cool $4.5 billion. 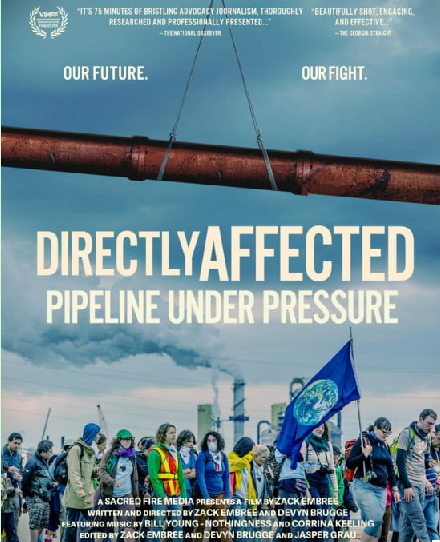 This compelling film on the resistance to Kinder Morgan was co-sponsored with Fair Climate Transition, at St James United Church. 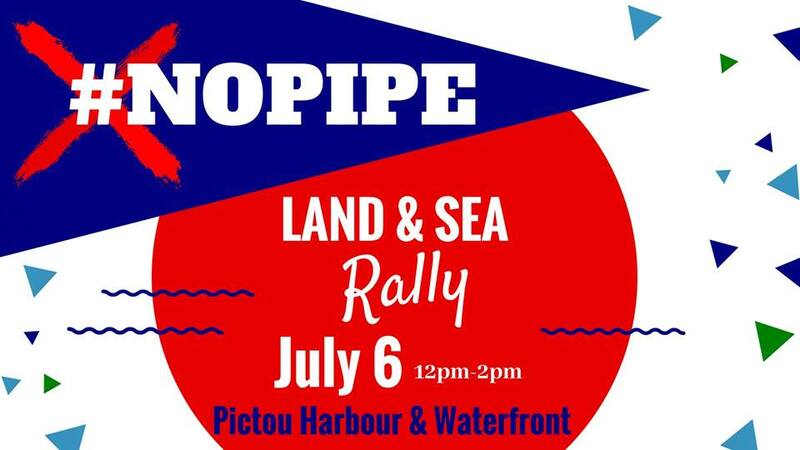 More than a thousand people marched on land and hundreds of fishing boats, led by Mi’kmaw fishers, processed into Pictou Harbour to draw attention to the Northern Pulp facility’s plan to discharge millions of litres of treated pulp waste daily into the Northumberland Strait. 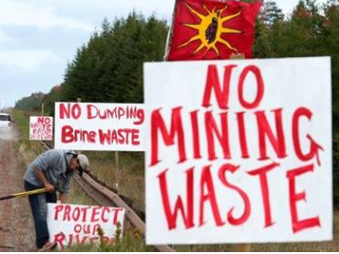 A dozen or more REA members joined in the land march, and a letter was sent to Minister McKenna requesting a Federal-level environmental assessment. 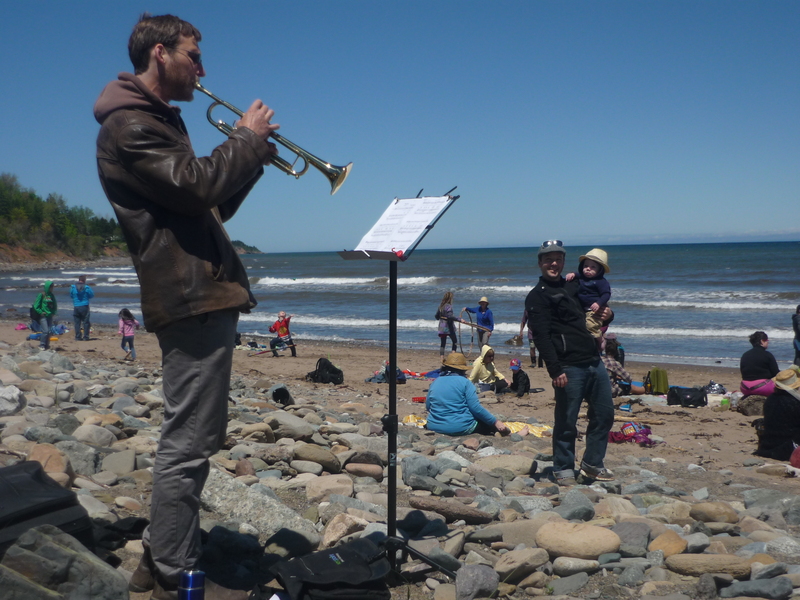 On a beautiful Saturday, June 9th, we gathered at Mahoney’s Beach to celebrate the oceans and their life-giving force. 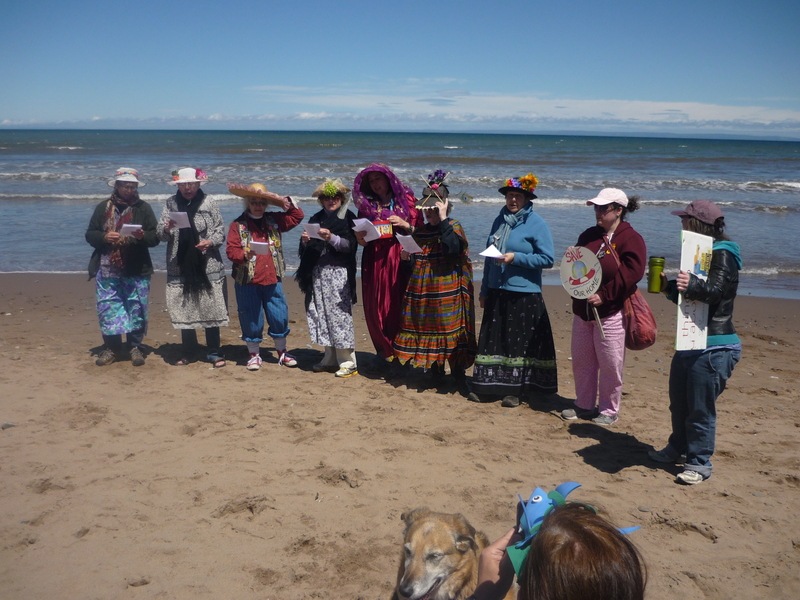 A welcome from County Councillor Donnie MacDonald, songs by the Raging Grannies, a touch tank for the kiddies (and adults!) 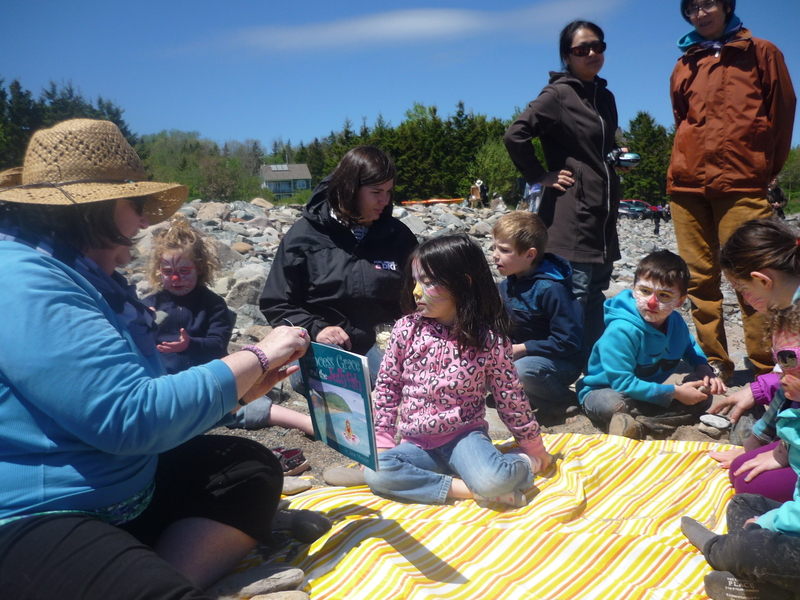 and a guided walk helped us all focus on the importance of a healthy ocean free of plastics. Community members gathered to learn about and help shape the future of active transportation in Antigonish. Hosted by Antigonish Community Energy and Responsible Energy Action, the event brought together stakeholders with interest in many elements of active transportation. More work on this topic will be a focus for the next year. We cooperated with the Antigonish Emergency Fuel Fund to raise donations to their Valentine’s Day appeal. The Fuel Fund provides emergency support to families who are unable to heat their homes. In 2018 support went to more than 100 families in Antigonish Town and County, most having an annual income under $15,000. In 2016 Standing Rock, North Dakota became one of the most watched places on earth. The Standing Rock Sioux Tribe attracted world attention through their peaceful resistance to the Dakota Access Pipeline. Awake, A Dream from Standing Rock captures the story of how this defiance is changing the way we fight for clean water, our environment and the future of our planet. 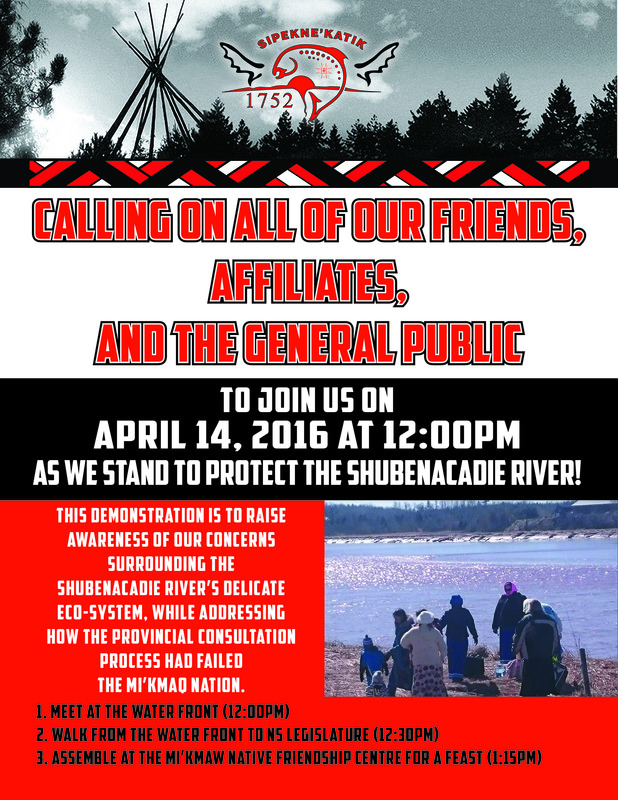 April 22, 2017 — Earth Day We showed Saving the Shubenacadie , followed by discussion of the Alton Gas project and the ongoing resistance by Water Protectors at the Shubenacadie River site. Doreen Bernard, Dale Poulette, Robin Tress and Carrie-Ellen Gabriel joined in a panel presentation about the impacts of and resistance to underground natural gas storage by Alton Gas. The project proposes to solution-mine huge salt caverns and release the resulting salt brine into the Shubenacadie River. View the recorded panel discussion here! 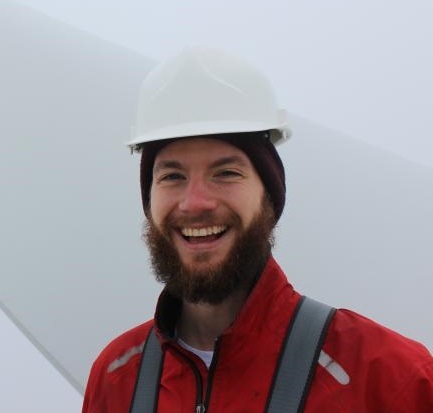 Stephen Thomas, Energy Coordinator at the Ecology Action Centre, made a presentation at the Youth Activism Conference in Antigonish. His presentation focused on the need for action in the face of climate change, proposed LNG plants in Nova Scotia, and some strategies to promote divestment from fossil fuels at the institutional level. 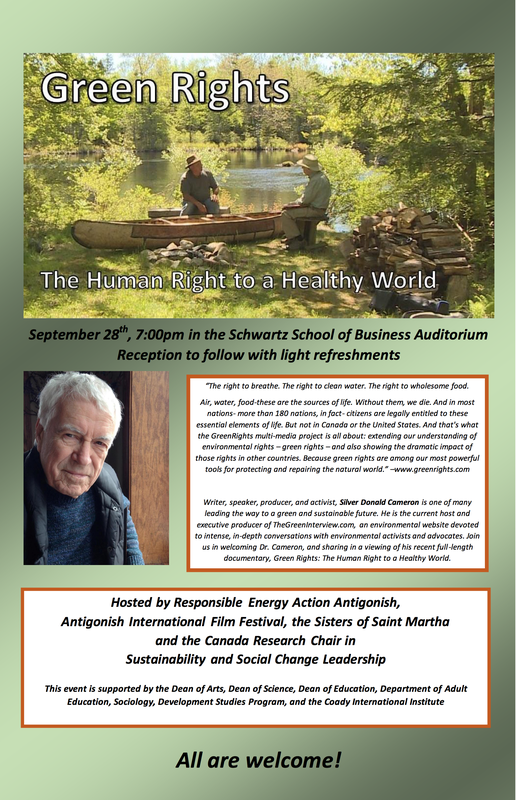 Over 200 people turned out to see Silver Donald Cameron’s new film, Green Rights: The Human Right to a Healthy World. The celebrated author, speaker, producer and activist answered questions and signed books after the film. 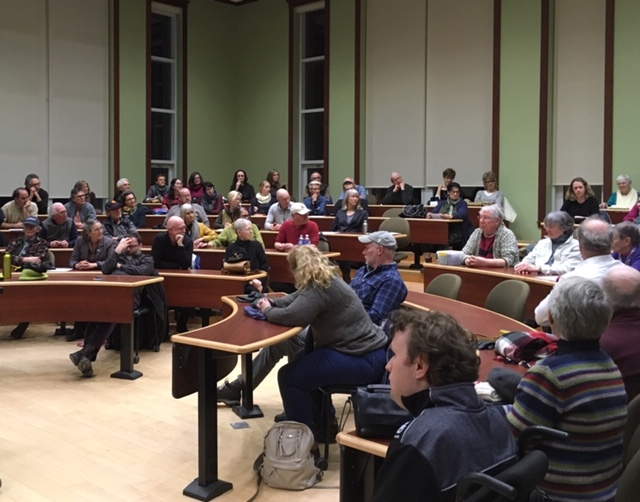 The event was co-hosted with the Antigonish International Film Festival, the Sisters of Saint Martha, and the StFX Canada Research Chair in Sustainability and Social Change Leadership. Various REA members travelled several times to Fort Ellis near Stewiake, to participate in and witness the building of a traditional truckhouse (along with eel weirs and the setting of traps, a pier and a fishing boat) on the banks of the Shubenacadie river, and the enacting of the Treaty of 1752 right of the Mi’kmaw to fish. 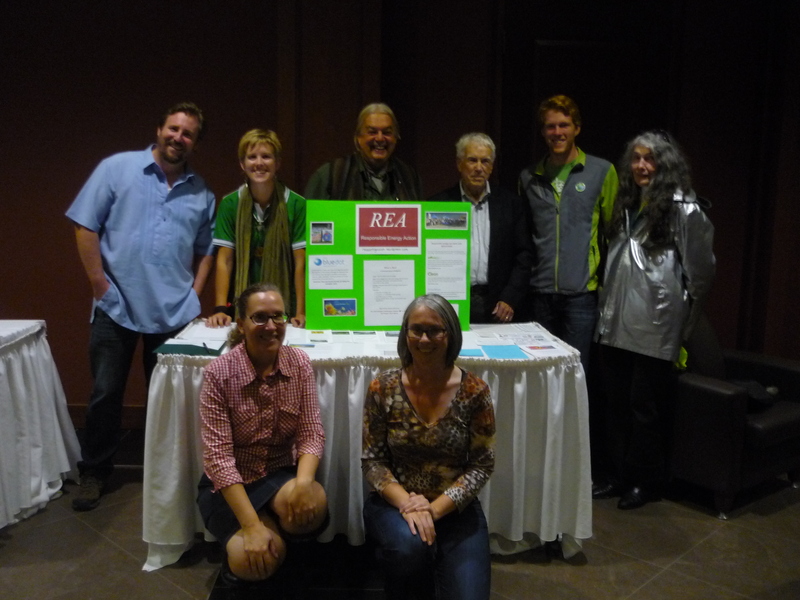 REA provided Green Ribbons for Climate Action, and assistance with a display about the fossil fuel impacts of plastic water bottle production. 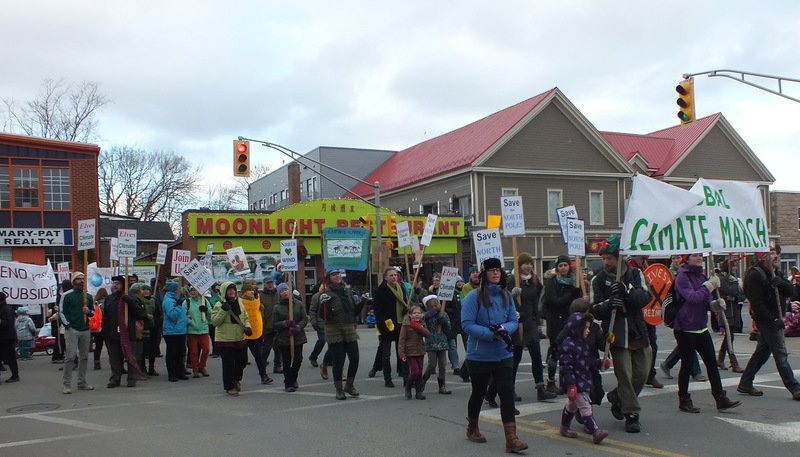 April 14, 2016 — Stop Alton Gas! 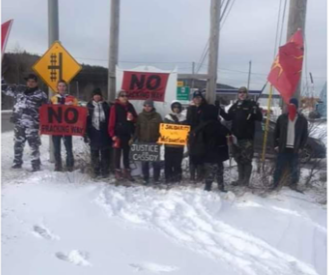 A number of REA members travelled to Halifax for a demonstration organized by the Sipekne’katik Mi’kmaq community to raise awareness of concerns about the Shubenacadie River’s delicate ecosystem and how the province’s consultation process has failed the Mi’kmaq Nation. 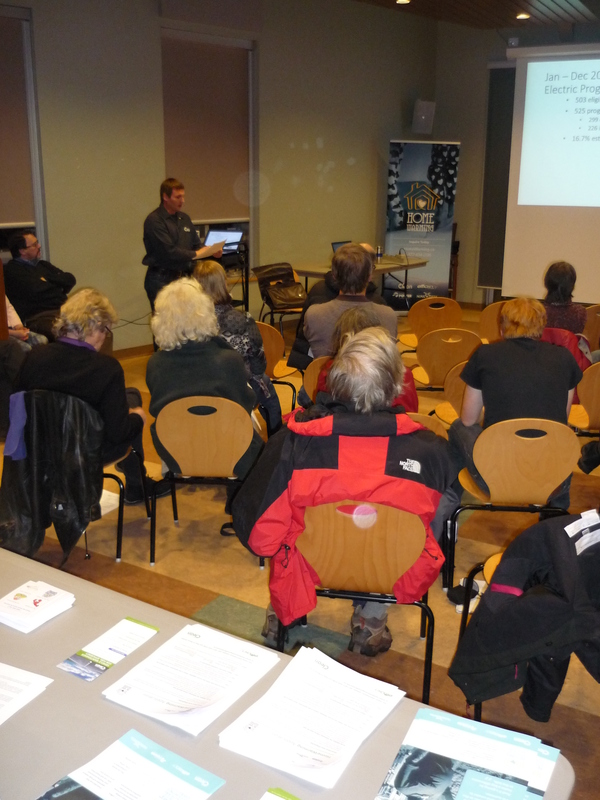 REA held an energy efficiency event at the People’s Place (Antigonish Public Library). REA members and StFX students presented information on how Nova Scotians use energy, and tips and tricks for saving money, staying warm, and reducing your footprint. Guest presenters from the Clean Foundation and Efficiency Nova Scotia provided information on the various energy efficiency programs available. Elves out to save the North Pole (and the South Pole). 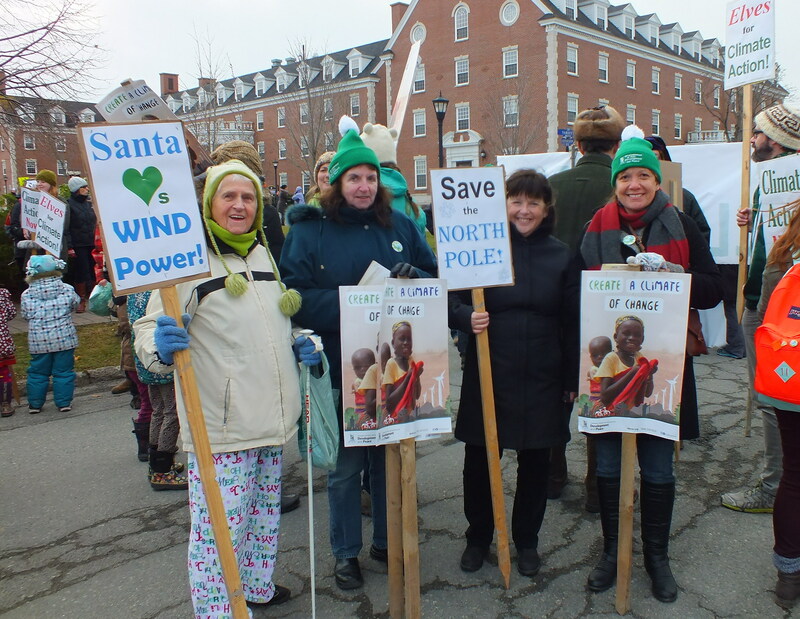 The Antigonish event coincided with the annual Christmas Parade so the climate marchers joined that procession. Of course the parade also included Santa Claus, one of the world’s best known climate change victims. Local organizers have not yet been able to reach Santa for a statement. They expect him to endorse their efforts to draw attention to the plight of the North, where the climate is changing more quickly than anywhere. Before the march, local experts facilitated workshop sessions on how to address climate change through policy, technical solutions and leadership. 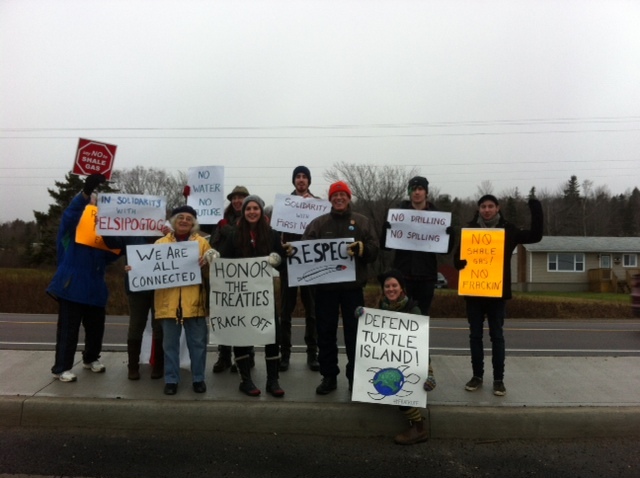 See http://antigonishclimate.ca for more photos. 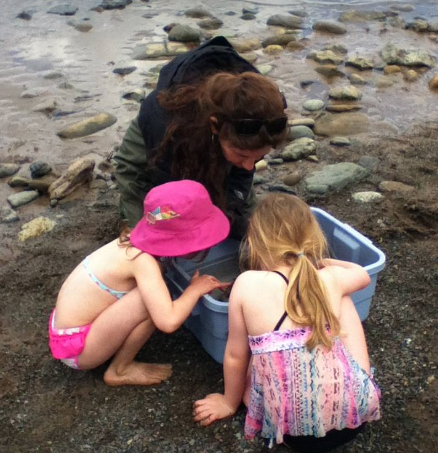 October 2015 — Antigonish is a Blue Dot Community! 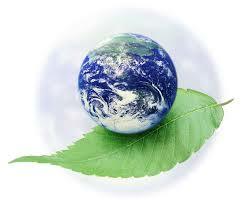 On October 19th and 20th, Antigonish Town and County Councils unanimously endorsed the Blue Dot declaration! 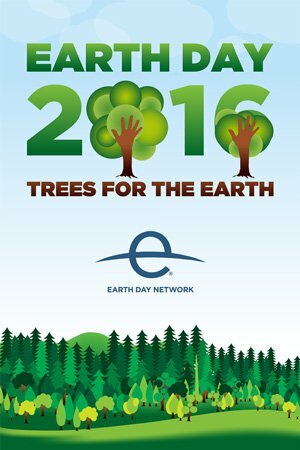 Once again our municipal councils are showing their leadership on environmental concerns. REA expresses appreciation for the support of our councillors, mayor, and warden for this and other sustainability initiatives. We had a great event at the Prissy Pig Café, with music, information about local environmental projects, and activities for the kiddies! It was chilly and windy, but nothing scared us off! 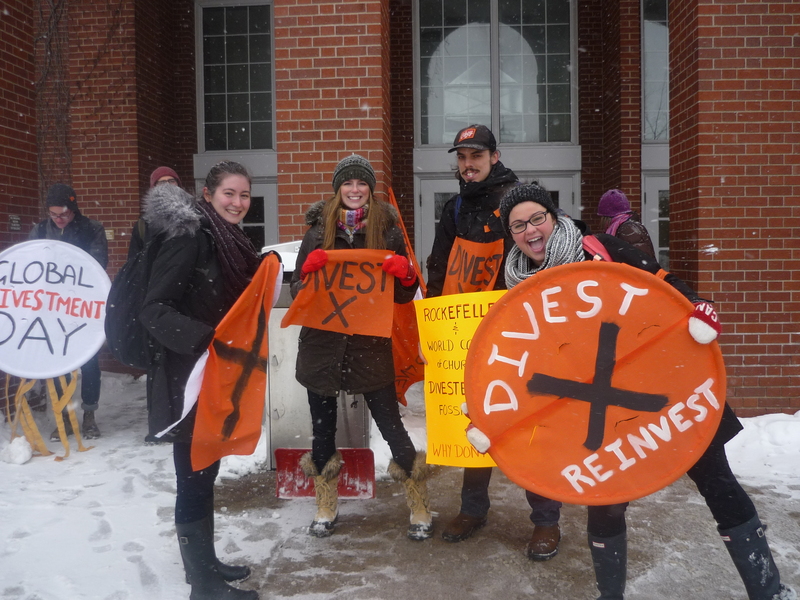 We marched from the Angus L Macdonald Library to the People’s Place Library to raise awareness and stir up action on divesting from fossil fuels. Even the World Bank President and UN Secretary General agree! Hugh Haley inspired us at the People’s Place Library. The two public sessions held by Dr. Wheeler in Port Hawkesbury and Stellarton were attended by a total of 25 REA supporters, who asked questions about and suggested revisions to the presentation. Further information on the Review and a link to its final report can be found here. 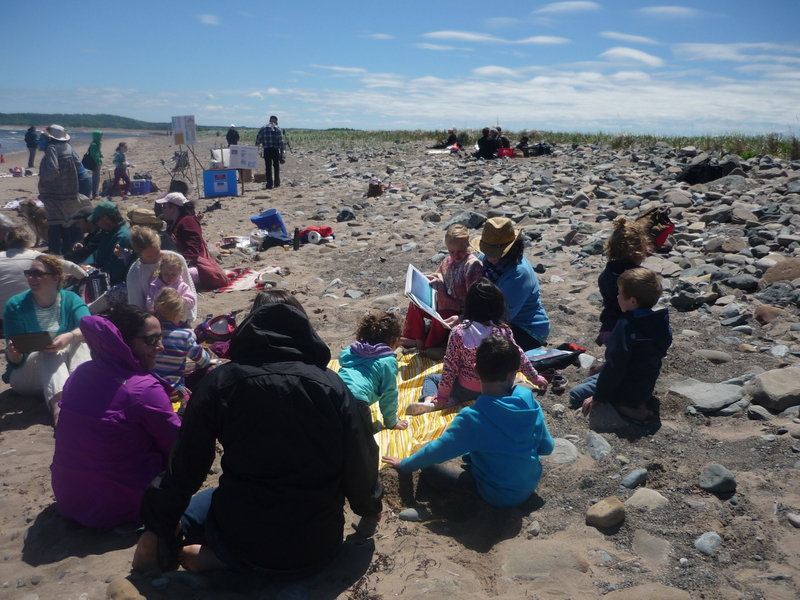 On a picture perfect day, the Antigonish community gathered on Mahoney’s Beach to celebrate our beautiful ocean and learn a bit about how to protect it. See the video by Gavin Fraser here. A great turnout of REA members and friends heard an excellent presentation about energy efficiency and policy on the municipal, provincial, and regional scale. Nova Scotia leads the country in annual energy savings, thanks to the leadership of the independent agency Efficiency Nova Scotia. 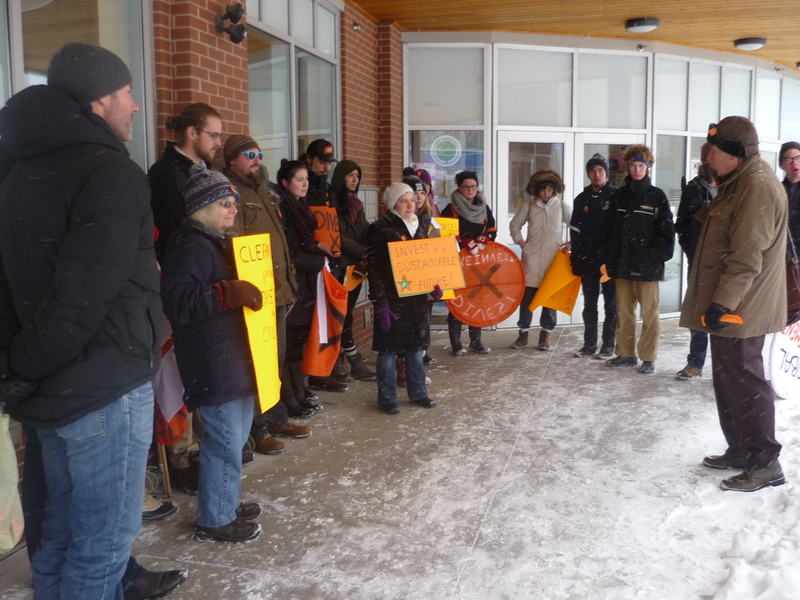 REA members joined friends from Antigonish and Waycobah to express solidarity with those protecting their lands against seismic testing for shale gas in Kent County, New Brunswick. November 28th & 30th: Two Great Community Events! Heidi Verheul of the Sierra Club Atlantic led us through a presentation and workshop focusing on debunking the myths of fracking and communicating effective messages. Saturday, November 16th — National Day of Action on Climate Change: Over 130 communities across the country joined together under the banner “Defend our Climate — Defend our Communities” We had a great time at the Antigonish Farmers’ Market with songs from the Raging Grannies, beautiful buttons to give away, colouring pages for the kids, and lots of opportunities to talk to people about the issues. 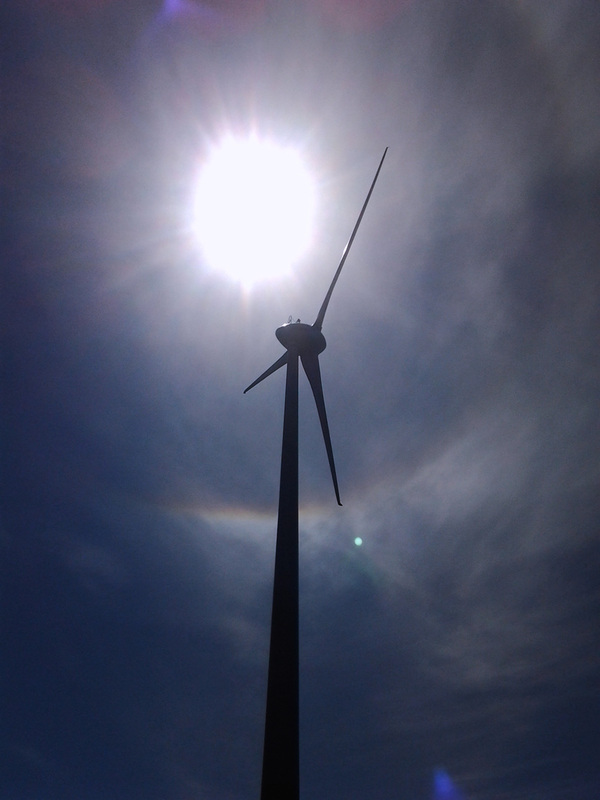 Thursday, September 5th — Seeing is Believing Tour Several REA members travelled to Tatamagouche to participate in the “Seeing is Believing” tour, which included a visit to the Spiddle Hill wind field and presentations by a number of leaders in the renewable energy sector in Nova Scotia. Tips on driving more efficiently. REA and the Municipality of the County of Antigonish sponsored a free”DriveWiser” session Thursday July 4, 7 pm at the People’s Place Library in Antigonish. Derek Gillis of Clean Nova Scotia’s DriveWiser program helped participants learn how to save gas, save money, and help the environment by changing just a few driving habits. June 18, 2013 — Presentation to Antigonish County Council David MacLean and Sr. Agnes Beaton made an excellent presentation to Council on the possible impacts at the local level of shale gas development. The presentation was well-received, and a number of councillors asked follow-up questions that signalled their engagement with the topic. 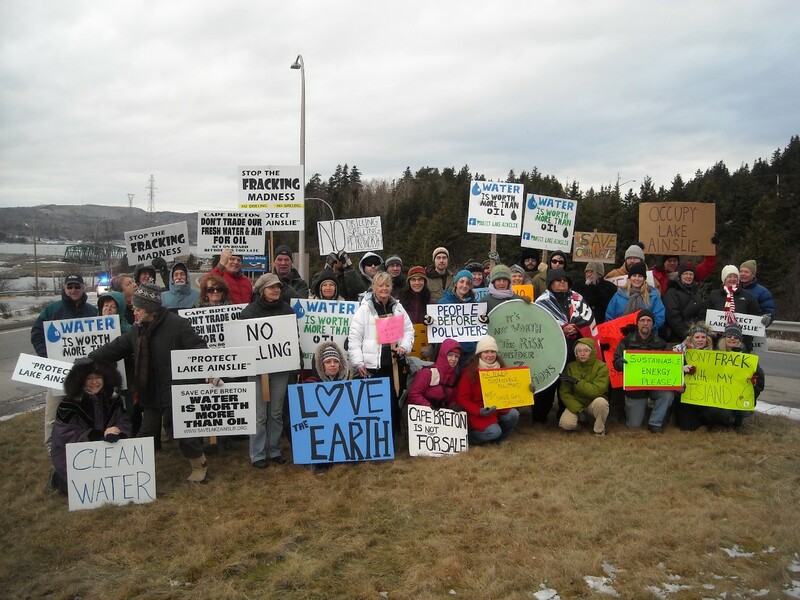 April 2013 — Petition to Ban Fracking Wastewater Importation: We collected 325 signatures on a petition to stop futute importation of hydraulic fracturing wastewater into Nova Scotia. 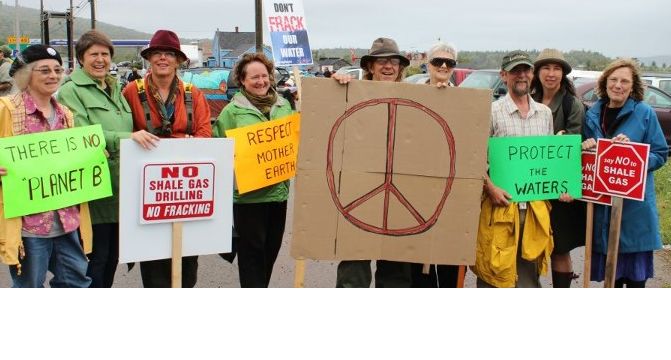 Atlantic Industrial Services (AIS) in Debert currently imports fracking waste from New Brunswick, and may be asked to accept waste from Newfoundland and Labrador. March 20, 2013 — What’s up with Fracking? We had a very well-attended film and discussion at the People’s Place. After showing the film Shattered Ground, narrated by Dr. David Suzuki. After the film, Dr. David Risk of St.FX Earth Sciences department and Kris Hunter of the Biology department provided clear and helpful answers to audience questions. Two municipal councillors showed their interest by joining us for the evening. Thank you! 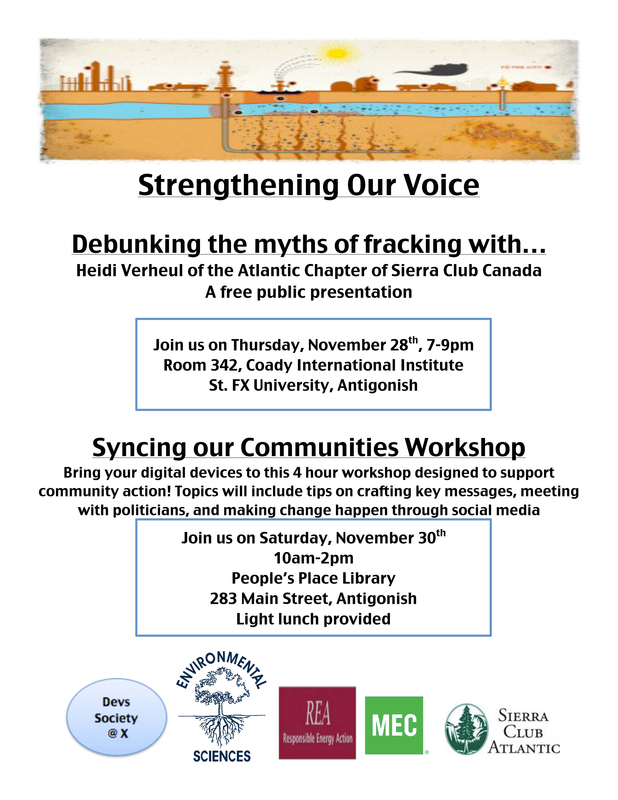 December 12, 2012 — Powering Down: The Powering Down project is an initiative of the Earth and Hearth Collective in Antigonish. The project aims to help people reduce household energy consumption. Dr. Beth Lange, Sr. Donna Brady and Ed Watson explained the content of the program, which will begin in February. 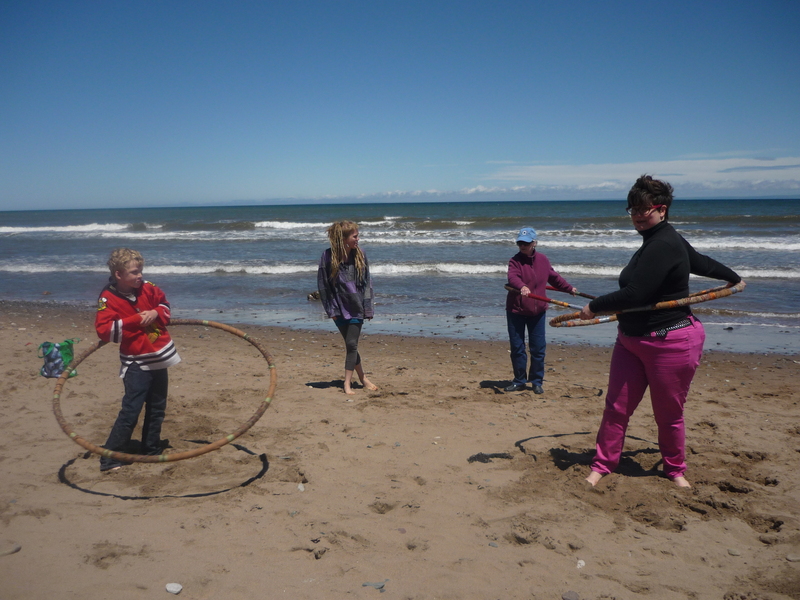 Local families from Antigonish town and county are invited to participate. 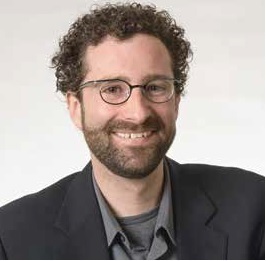 November 8, 2012 — Canadian Extractive Industry, Human Rights & the Law: REA and Antigonish Breaking the Silence hosted a presentation by Cory Wanless, of the progressive Toronto law firm Klippensteins, Barristers & Solicitors. Klippensteins is currently counsel to Alberta oil consultant and activist Jessica Ernst in her lawsuit against the oil company EnCana for the contamination of her water through its hydraulic fracturing for shallow coalbed methane (www.ernstversusencana.ca) They are also representing community members from El Estor, Guatemala in a civil suit against the Canadian company HudBay Minerals, Inc. (www.chocversushudbay.com). 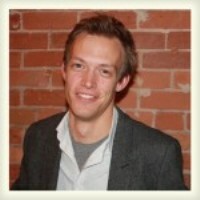 In 2010, Klippensteins represented filmmaker Steven Schnoor in a successful defamation lawsuit against Canadian Ambassador to Guatemala Kenneth Cook,who had made false claims that Mr Schnoor’s documentary misrepresented the eviction of residents of El Estor by Vancouver-based nickel mining company Skye Resources. 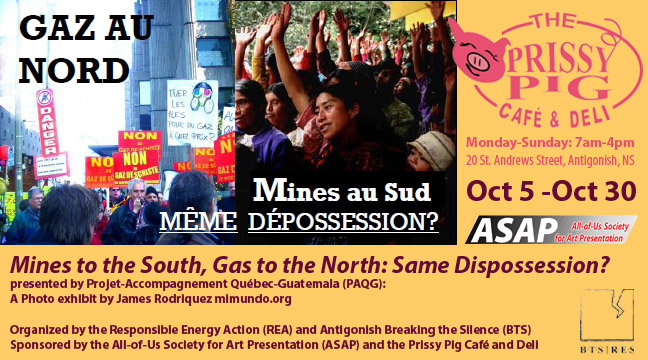 October 5th through 29th — Photo Exhibit at the Prissy Pig This powerful exhibit, organized by Responsible Energy Action and Antigonish Breaking the Silence, drew parallels between mineral resource extraction in Guatemala and shale gas exploration in Québec. 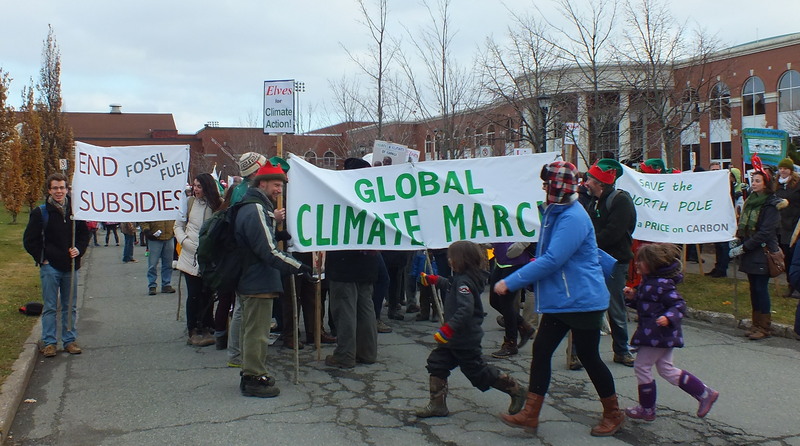 About 200 protesters, including a dozen of us from Antigonish, stood in unity at the end of the Canso Causeway for three hours. 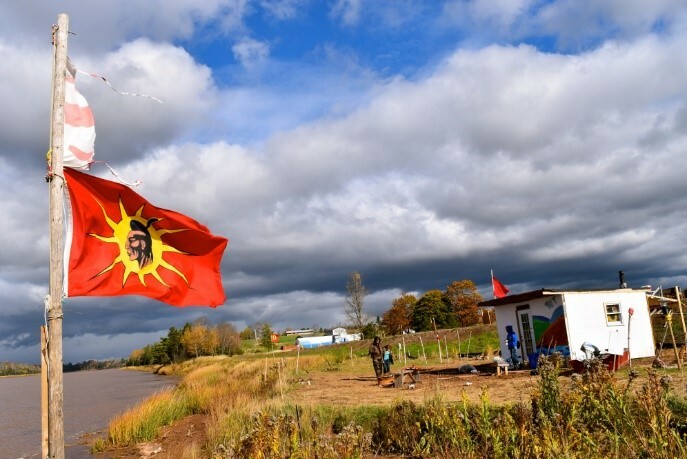 This was a significant time of solidarity between First Nations and settler peoples as we joined in a day of action against fracking, and in support of Lake Ainslie. 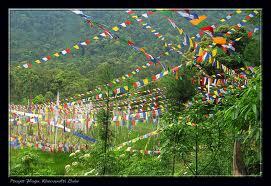 It was peaceful and it was powerful. September 13-15, 2012 — Action at the Canso Causeway: The Mi’kmaq Warrior Society and First Nations people from the Maritimes organized a three-day protest of oil and gas development. Over 2000 pamphlets were distributed, signatures were gathered on petitions, and support from the RCMP, Department of Transportation, and passing drivers was amazing! September 8, 2012 — Flag-making for the Environment: Our friends in Lake Ainslie requested our support and solidarity by making flags to honour the environment. 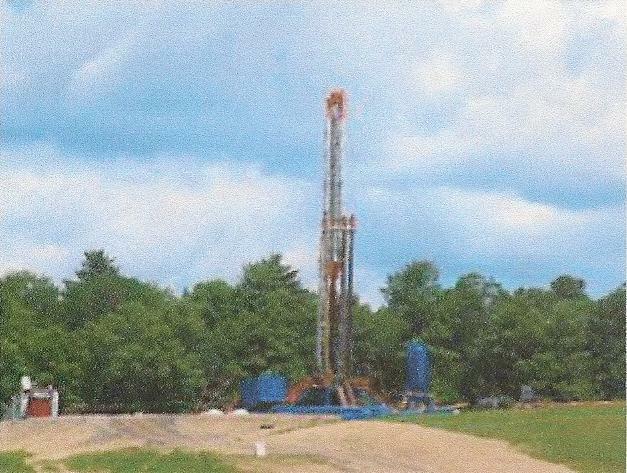 These were hung near the proposed PetroWorth drilling site on the shore of the lake, and were later moved to Elsipogtog in the summer of 2013. 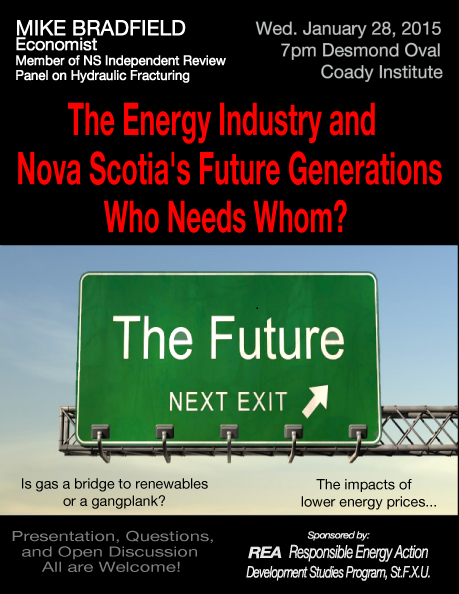 The focus of this meeting was the presentation “Hydraulic Fracturing — the Good, the Bad, and the Ugly,” by Antigonish native Stephan MacLellan. Steve is a member of APEGGA and a self deemed environmentalist who has worked in the frac industry for more than 11 years. He says he is pro-fracturing “as long as it is done safely and correctly.” The 40-person audience asked a number of well-informed questions! 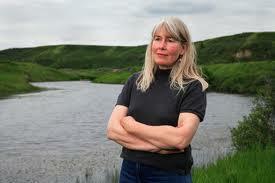 July 10, 2012 — Jessica Ernst in Westville: Jessica is the oil patch consultant and scientist from Rosebud, Alberta, who is suing EnCana, one of the continent’s largest unconventional gas producers, for negligence causing water contamination. 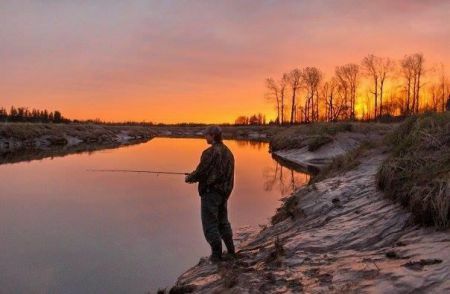 She is also in a legal action with the Alberta Energy Resources Conservation Board (ERCB), the province’s energy regulator, for breaching the Charter of Rights. Jessica is a very informed and committed speaker on the impact of fracking on individuals and communities. She was at the Westville Community Hall Gym on Tuesday July 10th at 7 p.m. Members of Responsible Energy Action attended. May 6, 2012 — Rally at the Causeway. We joined our friends from Lake Ainslie in drawing attention to PetroWorth’s plan to drill for oil near the lake beginning this June. As usual, the weather kept us dancing (to stay warm!). Lots of positive response from those who drove by — this issue really touches a nerve in Cape Breton. April 25, 2012 — Jennifer West, Groundwater Coordinator at Ecology Action Centre gave an excellent presentation at the People’s Place, Main Street Antigonish. More than 50 local residents attended, asked pertinent questions, and enjoyed tasty refreshments! 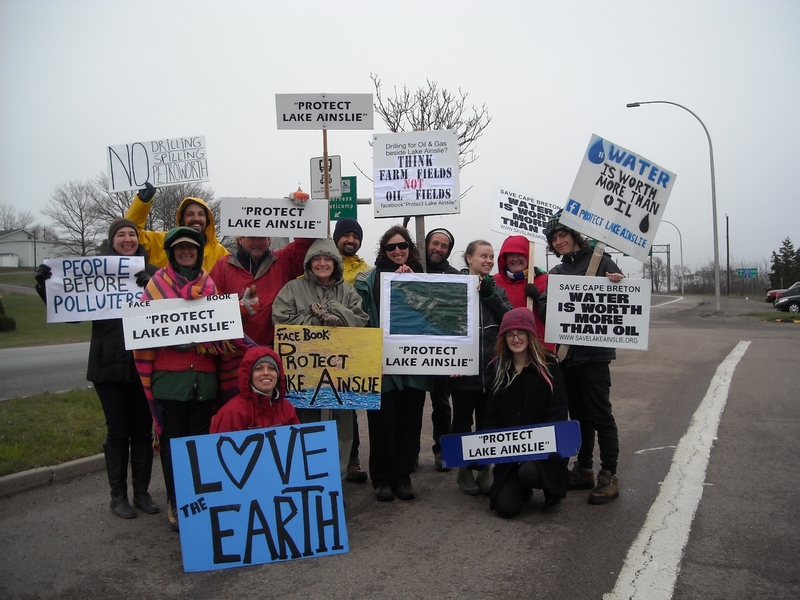 January 2012 — Rally at the Causeway: More than 50 people gathered in the bitter wind at the Canso Causeway to draw attention to oil and gas exploration in Nova Scotia. Later, we met with our local MLA to share information and inform him of our concerns. Our issue paper can be found here. 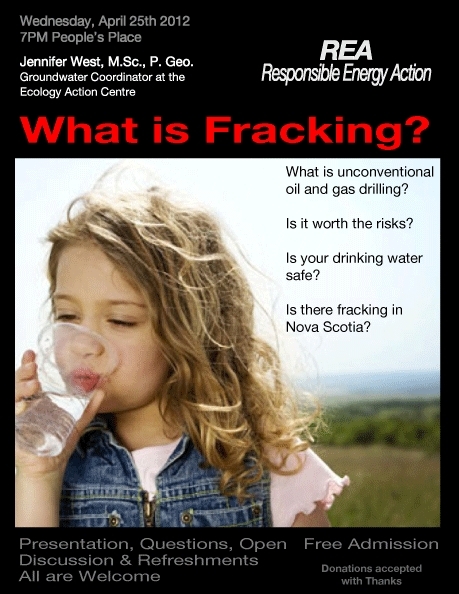 December 2011 — We collected over 250 signatures on a petition to ban hydraulic fracturing in Nova Scotia. Several members attended the “Protecting Our Communities” conference in Truro. The film Gasland was shown at the People’s Place Library, and Dwayne MacEachern provided information on proposed drilling at Lake Ainslie.